Are they going to Steal 2008? And if you’re in LA and New York, don’t miss the opening of the film that pulls down the pants of the Ohio election, “Free For All.” Follow John Ennis into the colon of American democracy, Ohio 2004. It’s funny as hell – oddly, democracy’s death can tickle your funny bone while laying out the story of the latest quadrennial vote heist. Watch the trailer here. 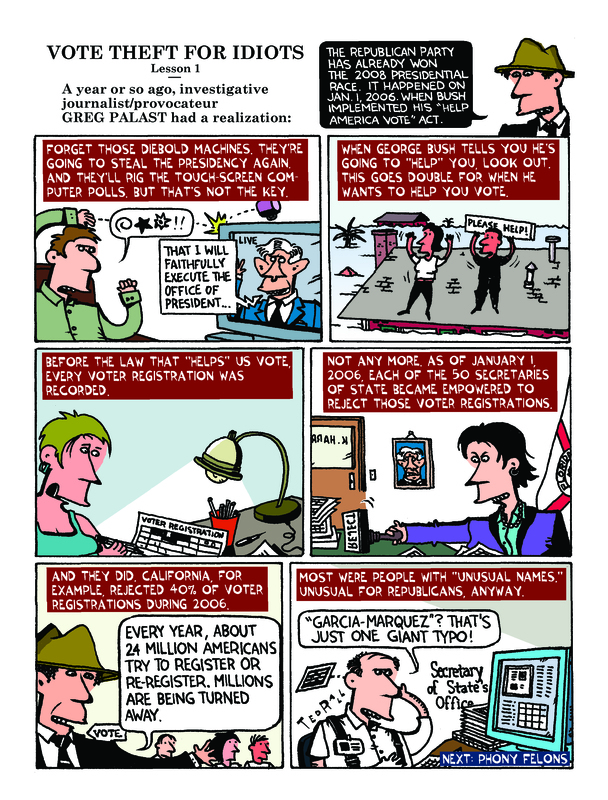 Greg Palast, author of the New York Times bestsellers Armed Madhouse and The Best Democracy Money Can Buy, is a Nation Institute/Puffin Foundation Writing Fellow for investigative reporting. Sign up for his investigative reports, films and ‘toons at www.GregPalast.com. Ted Rall is author of Silk Road to Ruin, the graphic diary of oil wars in Central Asia. Get the Palast and Rall books, signed, as a gift, for your tax deductible donation to the fund for investigating the 2008 election at www.PalastInvestigativeFund.org. Driving the surge in gas prices?